A modern compact little house situated on 50 acres of private land, covered with woods, bushes, rocks and heather. 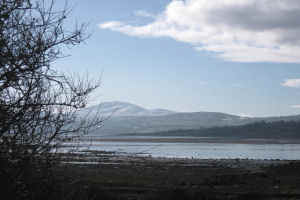 It is only 50 yards from the north shore of Trawbreaga Bay, a wildlife sanctuary. It faces south across the Bay to Slieve Snacht, 2019 ft, and the Clonmany Hills. Malin village, one and a half miles to the east, can cater for daily needs, and Carndonagh, 6 miles, has many more shops and supermarkets. Half a mile to the west is the entrance to the Bay, and Five Fingers Strand  one and a half miles of sand and sandhills on the Atlantic. The bedroom has a double bed, and a bed-settee in the living area. 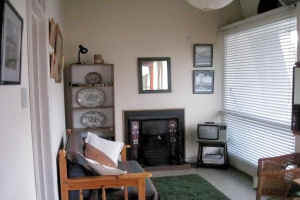 The cottage has electric fires in all the rooms, as well as the 3kw. off-peak storage heater, and an open fire. Electricity is charged by meter  NOT SLOT  and water is heated by instant immersion heater. 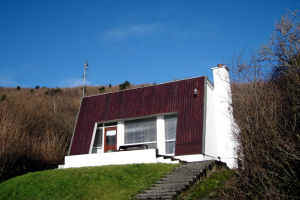 The cottage is fully equipped, bed linen and towels are provided. There is a TV set. Rock Cottage is inspected and approved by Bord Failte.